The Frickin’ Awesome Entrepreneur is all about mastering your mind, gaining the skills you need, and dominating as a business owner., starting with the fact that YOU are already Frickin' Awesome. You've got unique experiences, education, values, and StrengthsFinder profile that makes you truly one-of-a-kind with unique contributions to the marketplace. AND you are not meant to do it solo. 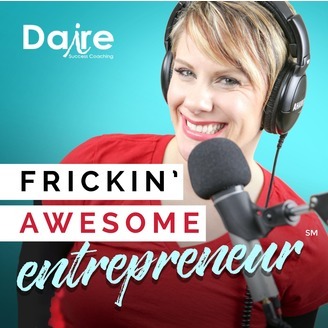 In each episode, Alissa Daire Nelson sits down with a Frickin’ Awesome Entrepreneur to talk about the underrepresented realities of entrepreneurship. If you’ve ever tried to build a business, or have any desire to do so, be sure to subscribe right now and become a Frickin’ Awesome Entrepreneur yourself. As small business owners, when we start our business, the ultimate goal is to hit a certain figure and be successful, which is what we had always imagined it to be. Anytime that happens, we celebrate and give ourselves a tap on the back for a job well done. But mind you, celebrations can often be short lived, and soon we find out that while we were still high on the success, the stress and challenges were keeping up too. New level, new devil—as I’d like to say. This episode today tackles the issues and challenges that a seven or six-figure business deals with. I asked my friend Chris to come and join us today. He has willingly shared two major drawbacks that he’d experienced, and together, we will share with you how you can take this challenge head on, what systems and processes to employ, keeping that check and balance, that way we can keep problems at bay or from resurfacing. There’s a lot in store for you in this episode; so clear your head, prepare your pens for some serious note taking because what we share here today might be helpful for you today, or in the future. As President & CEO of Actionable.co, Chris Taylor helps business consultants bring learning sustainment and measurable behaviour change to their client engagements. As the host of iTunes #2 ranked business podcast The 21st Century Workplace, Chris regularly hosts conversations with the world’s leading thinkers on leadership, change management and employee engagement, bringing his trademark curiosity and humour to the complex topics of business strategy and professional management. Chris has penned over 150 articles on aspects of our new world of work, and is a regular speaker on stages domestic and abroad. If you feel that the business objectives of the organization you work for are aligned with your personal objectives in a truly deep, meaningful way, that does nothing but positive things. The real challenge is taking a pause, how to take one or two ideas, and how to apply those in your life in a way that has lasting impact. Understanding how those strength themes are wired can help you redirect it. Work with people that are doing powerful work in their own space and find a way to support them in their work. Hone in on the craft of presenting, and organizing, messaging around stories, and how to make that meaningful for the audience. The more people you have, the harder it is to get everyone across. [01:20] An intro that made our guest glow. [11:33] That one tough call Chris made but paid-off well. [24:03] Alissa digs in deeper around Chris’ money issues. [28:54] How can Chris surpass his challenge on the business finances. [34:10] Alissa gives Chris a tip that she had just recently implemented in her business too. [35:40] How to find the Actionable platform. [37:14] Podcast recommendation of the week!